Facundo first rode as a youngster on 50cc bikes, going on to become a junior champion in the 200cc class. He was Argentinian champion in 2011 and competed in the World Under-21 Championship in 2012. Due to his European commitments he missed the first four (of nine) rounds of the Argentinean championship in 2012, but still finished in fifth place overall. In 2012 he linked up with Berwick in an attempt to further his career in Europe and when he was overlooked for a place in their 2013 team he had no hesitation in signing up with the Tigers instead. Facundo finished in second to Birmingham's Nicolas Covatti in the 2013 Argentinian Championship. Following Sean Wilson's injury in 2004 André assumed the skippers role and his form led to him being re-called to double-up for the Elite League Poole Pirates. André won the controversial Premier League Rider's Championship passing the unbeaten Simon Stead in the final before they both fell with André suffering injuries to both hands and wrists bringing his season to an untimely end. André took over from Sean as captain of the Tigers in 2006 a role which he reprised in 2007 scoring no fewer than 14 maximums and leading the Tigers to the play-off finals in both years. André announced that he was retiring from the sport prior to the Young Shield defeat to the Isle of Wight which concluded the 2008 season. André returned to the saddle with a brief spell on loan at Glasgow in July 2013 before rejoining the Tigers to replace the injured Richard Hall. British U15 champion in 2006 while riding for the Cleveland Bays, Joe was a member of the 2007 National League Scunthorpe team who steam-rollered all before them but he signed for Wolverhampton days after his 16th Birthday. In 2008 he joined National League Boston and doubled up in the Premier League with Workington. For 2009 he combined Premier League Rye House with appearances as No.8 for Elite League parent club Wolverhampton. He joined Premier League King's Lynn for 2010 recording a 7.22 average from 15 meetings and won the British U21 title at Lakeside before switching to Redcar. Wintering in Australia Joe suffered horrific injuries at Gillman with multiple fractures and a punctured lung. His recuperation was hampered by a lung infection causing him to miss the start of the 2011 campaign. He managed a couple of meetings for Newport before switching to Scunthorpe as cover for the injured Carl Wilkinson, but struggled to regain his form. 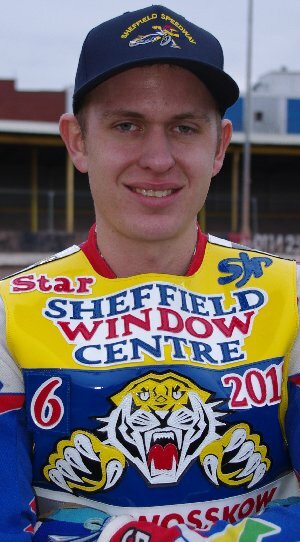 Joe joined the Tigers for 2012 and soon regained his confidence as he got to grips with the big Owlerton track. He returned to Monmore Green for the British U21 Final in April scoring 11 points. He beat Kyle Howarth and Steve Worrall to qualify for the final in which he just held off a determined challenge from Tom Perry to wrest back the title from Tai Woffinden. Joe struggled to recapture his form from last season on a regular basis and then picked up an injury in training which resulted in him retiring from the sport. Richard joined the Prowlers from Newcastle after a spell doubling up with the Diamonds and the Gems, wasting little time in regaining his confidence and showing them what a mistake they had made. He was called into the Tigers team as cover for injured Tiger Ben Wilson towards the end of the 2003 season and his impressive performances made him the obvious choice for the Tigers second reserve berth in 2004, although he finished the season riding at No.3 as the management attempted to juggle dwindling rider resources. He started the 2005 campaign as a second-string and solid performances both home and away improved Richard's average seeing him finish the year challenging Ricky for the third heat-leader position. Richard became a victim of the averages trap and was left out of the Tigers plans for 2006 but he stepped up into the Elite league and went on to become the Peterborough Panthers hero helping them to the Elite League Championship with a brilliant display in the final against Reading. 2007 saw Richard picking up a foot injury riding in the Garry Stead Grand Prix just days after being released by the Panthers, but he returned to the track as the Scorpions skipper when Scunthorpe joined the Premier League in 2008, finishing second in their averages. Richard was back with the Tigers for 2009, put half a point on his average, finished second (again) in the team averages but had to sit out the end of the season as a result of multiple crashes in September. 2010 saw him disputing the 3rd heat leader slot with Josef Franc which he just shaded by the end of the season. He started 2011 as the skipper of the Leicester Lions but was released when his longtrack commitments caused him to miss too many meetings. He finished the season with Scunthorpe who called him up to cover for the injured Viktor Bergstrom. Back at Owlerton for 2012 Richard was made captain but in an indifferent year his poor away form prevented him improving his average. Richard's progress in 2013 was curtailed by a dislocated shoulder sustained in a fall at Berwick. He returned to the saddle before he was fully fit and although his longtrack results continued to improve, his speedway form dipped lower and lower and he eventually lost his team place to André Compton. Jake is the son of former England International and world finalist Richard Knight. He has joined the Sheffield Tigers on a full transfer but will continue to ride for the King's Lynn Young Stars in the National League. Damien is the son of Steve Koppe who rode for the Exeter Falcons alongside Ivan Mauger in the 1970's. He is an accomplished motorcyclist winning the Queensland state dirt track championship for 5 consecutive years before turning his hand to speedway. He currently lives in Leeds where he works as a motorcycle mechanic and had to journey back to Australia in order to apply for the correct work permit to allow him to ride competitively for the Tigers in 2013. Danny joined the Tigers in August finding the pace of the Premier League just as little to hot for him. In September he finished 3rd in the German U21 championship with 12 points to his name. First rode on a Cumbrian beach in 1999 and made his debut in the Conference League for Swindon the day following his fifteenth birthday in 2003. He's ridden for many clubs over then years but has had more than his fair share of injuries, then most recent of which was in March 2013 riding for Coventry against Birmingham at Brandon. Adam was content to wait until Sheffield had completed the required four home and away matches before they could re-declare their team and he makes his debut for the Tigers in the League Cup semi-final against Newcastle. Simon joined Workington for the 2003 season doubling up with Wolverhampton in the Elite. 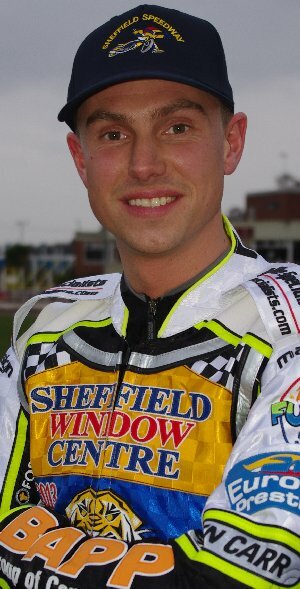 He won the Premier Pairs title with Carl Stonehewer and made it a hat-trick of British U21 wins. He made the step up to the Elite League joining Belle Vue in 2005, won the Elite Pairs with Jason Crump in 2006 and was given a wildcard at the British Grand Prix. 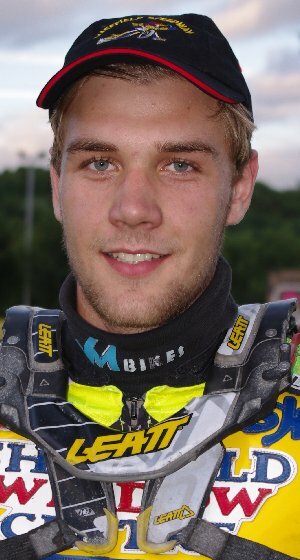 By 2007 he had progressed to heat-leader but was loaned to Coventry for 2008. In 2009 he transfered to Swindon where he enjoyed a testimonial meeting in 2012 and helped the Robins to their first ever Championship win beating the Poole Pirates in the play-off final. Born in New Zealand Ricky grew up and learned his speedway in America. Following qualification for the World U21 championship semi-final in 2008 he attracted the attention of Elite League Coventry who signed him up for the 2009 season. Ruled out of doubling up for a Premier League team he went straight in at the deep end with the Bees. Ricky popped home for the American National Championships in August and became the youngest ever winner (18 years and 54 days). He joined Stoke for the 2010 season and continued to double up at Brandon with the Bees. Wolverhampton swooped to sign him for 2011 and he finished the season helping out at Premier League Plymouth. Ricky joined the Tigers in 2012 and continued doubling up with Wolverhampton. It took Ricky a while to dial himself into the the Owlerton circuit which is so different to Monmore Green but he finished the season strongly and should form a strong double spearhead with Simon in 2013.